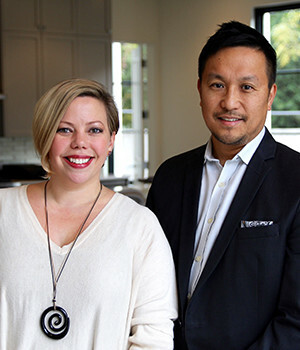 Bianca Boutell and Kenneth Lo are Realtors of the Boutell-Lo Group at The Associates Realty, a real estate brokerage by Robert Elliott. They are a husband and wife team that is intentionally and intelligently built to be better than what’s come before. They are dedicated to the clients we serve, the communities where we sell and the environment where we live. The Boutell-Lo Group is the next generation of real estate professionals for modern clients, leveraging start-up energy with stellar service and highly specialized knowledge of area neighborhoods. Bianca is a Dallas native who began her career in the United States Air Force. She was stationed active duty in Northern Italy before launching her career in luxury food and retail in New York City, most notably running operations at Dean & Deluca and established the Starbucks/Teavana flagship Tea Bar concept in Greenwich Village while working closely with Howard Schultz and Starbucks’ corporate team. Ken served as an in-house corporate/intellectual property attorney at several multinational pharmaceutical companies and has co-founded several startup companies. Ken’s extensive experience in deal flow include individual licensing deals worth up to $750 million in up-front and milestone payments, as well as a $13.7 billion merger & acquisition of a Swiss pharmaceutical company. Bianca and Ken have found a natural synergy in their understanding of the luxury market and their ability to navigate the art of a deal to best serve their DFW real estate clients. As connected members of the DFW community, Bianca and Ken freely give their time to foster local economic and social growth. Bianca is active in various veterans group, as well as in a women’s ministry at her church, while Ken mentors in the DFW entrepreneurial community and holds advisory board positions at several technology startup companies. Bianca and Ken are committed to real estate education and personal growth while being humbly inspired by the likes of Richard Branson, Tony Robbins, Gary Vaynerchuk, Jeff Olson, Charlie Munger, and John C. Maxwell. Bianca spends time in the creative arts and is passionate for culture, food and wine; and Ken is an active musician, runs the occasional marathon, and enjoys spending quality time with his children.